The move of trading volume to the end of the day in Asia and globally highlights a large natural liquidity event even for those not benchmarked to the close directly. The trend toward using the closing facilities—spurred by the continued growth of passively invested funds and the relatively low cost for liquidity at the close—raises a number of important questions about how best to interact with this volume. Closing volumes in S&P/TSX Composite names have grown by greater than 1.5 percentage points to 4.6% over the past two years. Meanwhile, trading in the last 15 minutes in the same period, grew and then reverted to historic levels. The 5% of share level is the lowest, by far, of any of the markets we examine in this paper. This is likely best explained by both the relatively high exchange fees of the Canadian closing facility and the high level of intraday turnover in composite names, resulting from arbitrage between fungible listings of like names in the US market. The Canadian close runs at 16:00 Toronto time, with orders entered during the regular trading session. The closing auction has a single imbalance publication at 15:40. Updated imbalances are given at 16:00 only if a given name is going to move more than 3% from the last tick. The market in the US, like those in Japan and Canada, has higher levels of trading in the final 15 minutes than the auction itself. That said, auction share has grown dramatically over the past year. The US is unique in that it has two large exchanges running slightly different closing auctions (i.e. the NYSE and Nasdaq). Both facilities run alongside the continuous trading books, but the NYSE facility has designated market makers participating in the price-setting process, while Nasdaq does not. The two markets have surprisingly similar levels of MOC participation, suggesting that structural differences have little impact on investor use of an auction. S&P large-cap names have grown considerably more in MOC share than small- or mid-cap stocks. Large, mid and small market caps saw a similar percentage traded in the close back in Q2 2016; large-caps ended over a full percentage point higher than mid- and small-caps in Q1 2018. ETF volumes traded a modest 3.4% in Q2 2016 and increased to a high of 4% in Q3 2017. While still much lower than what we see in the equity space, this is nearly an 18% increase. MOC relative share has grown by more than 40% in CAC 40 names over the past two years, but trading share in the final 15 minutes has remained virtually flat. Like most European exchanges, the MOC facility at Euronext Paris is separate from continuous trading. Continuous trading ends at 17:30 Paris time, when the closing auction opens. The closing cross occurs at a randomized time between 17:35 and 17:35:30. MOC share grew roughly 20% over the two years in DAX names. This is more modest than most of the markets we studied, although still very meaningful. During the period, we saw a very minor decrease in relative share traded during the final 15 minutes of continuous trading. The Deutsche Börse auction, like Euronext Paris, runs post the continuous trading session and has a randomized end time. The auction begins right at 17:30 and runs through 17:35 Frankfurt time. As is the case with most European closing auctions, the Deutsche Börse publishes updated indicative size and price data during the auction. MOC share of FTSE 100 stock trading is up more than 25% in our study period, while trading in the final 15 minutes is down very modestly. The LSE closing facility is similar to many in the European markets as explained above. The auction is a separate book that runs from 16:30-16:35, after the close of continuous trading. Stocks in the ASX 200 have seen a nearly 30% rise in closing auction market share over the two years. Meanwhile, relative share during the last 15 minutes of trading has been virtually flat. The Australian Stock Exchange closing mechanism runs separately from the continuous trading facility. Orders are entered during the Pre-Closing Single Price Auction from 16:00-16:10 Sydney time, with the actual match occurring between 16:10 and 16:12. 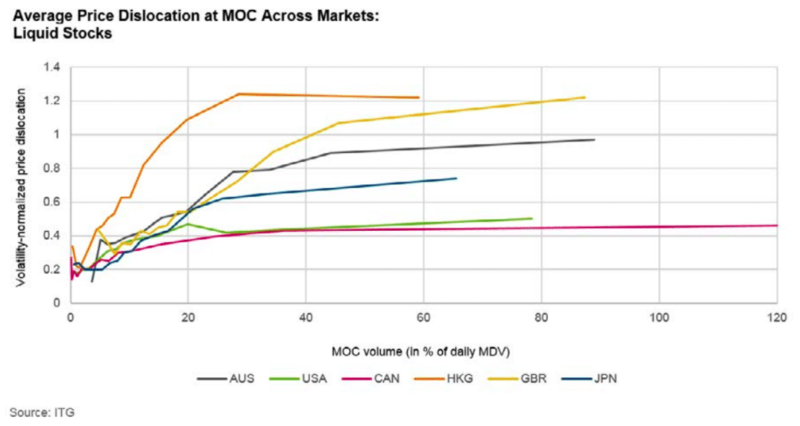 The MOC facility has lower relative share than most developed markets and has witnessed far more modest growth than many peers. This may be explained by the continued high levels of volume weighted average price (VWAP)-style trading in the Japanese markets. The closing auction runs at 15:00 Tokyo time and is a separate book from that of continuous trading, although continuous trading orders will roll into the auction. Market orders placed in the auction are assigned a limit price equal to the calculated daily limit price for a given stock. The Hong Kong Stock Exchange introduced a closing auction in two tranches, starting with the most liquid names on 25 July 2016. Previously, the closing price was calculated as the median of five prints, taken at 15-second intervals during the last minute of trading and a large percentage of volume completed in the last few minutes of the day. Since the introduction of the CAS, there is a clear shift in volumes toward the auction and, by Q2 2017, the auction accounted for as much volume as the last 15 minutes of continuous trading. The auction now accounts for just over 10% of volume in the Hang Seng Index. Hong Kong has taken a European approach to the close, with the auction being run separately from the continuous trading session. The auction starts at 16:00 Hong Kong time, with a randomized close between 16:08 and 16:10. The last thing we examined as part of the comparison was price dislocation. By comparing the last 30-minute VWAP to the closing price, we can look at relative performance across markets. This chart suggests that Hong Kong has the most price elasticity of the markets we looked at, while the North American closing auctions are more efficient. While dislocation is one important factor in market efficiency, there are others, such as price drift and ability to easily replicate a price. To this point, markets including Shanghai and Mexico use a VWAP price to determine the official close. It’s clear that volume is shifting to the end of the day in Asia and globally, which highlights a large natural liquidity event even for those not benchmarked to the close directly. At ITG, we are aiming to create a better framework for thinking about both close liquidity and market impact in a dynamic fashion. We welcome client feedback and questions in order to better inform our own research. 1ITG’s analysis focused on stocks included in market-level indices. 2A median of the individual stock’s bin trading as a percentage of daily stock’s trading, weighted by the VWAP price.